Charter flight from Miami to Havana, direct flight, approx. 50 minutes. You will be assisted at Miami airport. Or fly via Mexico. Meet and greet at Havana airport and private transfer to accommodation in Havana. Meet your bilingual guide who will be with the group for the next 7 days and commence a half day walking tour of old Havana to see all the important sights including the 4 squares, Obispo street etc. Stop for a drink in the famous Sloppy Joe’s bar in Zulueta street. Proceed to a private restaurant in Vedado which is located in a period house and is one of the oldest and best paladares in Havana. Here, we have a cooking class to learn how to make a traditional Cuban meal. Then you eat the lunch that you cooked. There will be a talk with the owner of the restaurant about how he started the business in the time when there were very few private restaurants in Cuba. After lunch, visit Hemingway’s house, La Finca de la Vigia, in the village of San Francisco de Paula outside of Havana. Return to hotel. Dinner at paladar. Visit the private home of a known curator of Cuban arts to see her personal collection of Cuban contemporary Art (the paintings are for sale and can be exported without problem to the USA). We have a simple lunch in her home. After lunch, we have a Cuban rum tasting in old Havana and a visit to the Rum museum to see how rum is made. Evening meal at San Cristobal paladar, the owner, Carlos, who is the cook. He has amassed a fine collection of Cuban memorabilia in the old salons. This is the paladar where Obama came to eat. 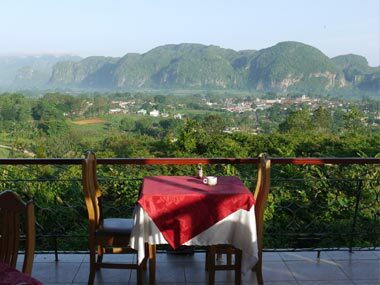 Full day visit to the Vinales valley with its beautiful landscapes reminiscent of oriental scenes. It is also the home to perhaps the most famous tobacco growing area in the world. We stop en route to visit a ‘Guarapero’ who makes the local sugarcane drink. Visit the ‘Vega’ of Hector Luis, a well known tobacco grower near the village of San Juan y Martinez in Vuelta Abajo, Cuba’s premium tobacco growing area. There will be tobacco plants at nearly full height in January, so it is an excellent time to visit. We have a tour of the plantation and see a drying barn for tobacco leaves. Have a Creole Cuban lunch here followed by a cigar and a talk with the owner about tobacco business in Cuba. Return to hotel in Havana and free evening. Today we visit an ‘Agromercado’ in Havana which is a market where vendors sell fruit and vegetables brought in from the countryside. In Cuba, locals buy fruit and vegetables from these markets, some being state owned, others private. Almost no fruit and vegetables are available in the few supermarkets. Return to Havana after breakfast. Check into hotel and then we take a tour with old Chevrolets or Buicks to tour Havana, passing along the Malecon, visiting Havana’s Kohly forest, cruising up Fifth Avenue to see the 1950s suburb of Miramar. Return to the hotel Nacional where we have a drink at the Hall of fame bar. Return to hotel for rest. This evening, farewell meal at Havana’s emblematic paladar, La Guarida, where the film strawberries and chocolate was filmed. Approximate price per person sharing double/twin room in 4 star hotels is from US$3990.